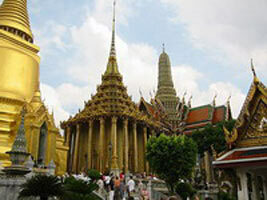 Our Bangkok tours could start at the Grand Palace in Bangkok, this is possibly the Thai capitals most famous landmark. Built in 1782 – for 150 years it was the home of the Thai King, his Royal court and the administrative seat of government – the Grand Palace of Bangkok is a steeped in culture and importance. The Grand Palace in Thailand is composed of stunning architecture and intricate detail which combine to create a place of much grandeur and splendour. Inside its mighty gold encrusted walls were also the Thai war ministry, state departments, and the Royal mint. 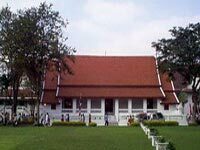 In present day the complex remains the spiritual heart of the Thai Kingdom and centre of Buddhist beliefs. Inside the palace complex are several impressive buildings and temples including Wat Phra Kaew (Temple of the Emerald Buddha), which contains a small, very famous and greatly revered Emerald Buddha with history dating back to the 14th century. The robes which adorn the Buddha are changed with the seasons by His Majesty The King of Thailand, and form an important ritual in the sacred Buddhist calendar. Thai Royalty stopped living in the palace at the turn of the twentieth century, but the palace complex is still used to celebrate all kinds of other ceremonial and auspicious happenings.The palace complex which is located on Ratanakosin Island on the banks of the Chaophraya River, has a layout similar to the ancient palaces of Ayutthaya, the former capital of Siam/Thailand. The Outer Court, close to the entrance, previously housed government departments which the King had direct involvement, such as civil administration, the military and the treasury. The Temple of the Emerald Buddha is situated in a corner of this outer court. The Central Court is where the residence of the Royal family and halls used for conducting state business were located. Two of the throne halls are still open to viewing by the public.The Inner Court is where the King’s royal consorts and daughters lived. The Inner Court was like a small city within the palace which was entirely populated by women and young boys under the age of puberty. The inner court is completely closed off to the public even though no Royalty now resides in this area of the palace. There is a distinct contrast between the architectural styles of the Thai Temple of the Emerald Buddha and the more European inspired design of the Grand Palace with the main exception being the roof . Other places of interest on our Bangkok Tours are Boromabiman Hall and Amarinda Hall,which are the original residence of King Rama I and the Hall of Justice.These spectacular halls with their impressive interior’s are still used for important ceremonial occasions like coronations. It also contains an antique throne which was used before the Western style one presently in use. 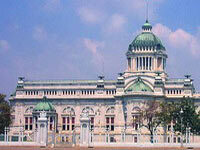 Visitors are permitted inside the spacious European style Hall or Grand Palace Hall (Chakri Maha Prasat). In addition it is possible to enter the impressive Dusit Hall, which is possibly the finest example of an architectural building in this style, with a museum that has information on the restoration of the Grand Palace, with scale models of the palace and temples and various Buddha images. The Grand Palace in Bangkok, Thailand is a stunning and majestic attraction which is well worth a visit when visiting Bangkok and is a perfect example of the amazing architectural skills used in the construction of one of Thailand’s most beautiful Royal Palaces. 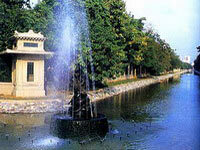 Suan Pakkad Palace is a place to observe Thailand and its architecture from a bygone era. Its name litterally means ‘cabbage patch’, in reference to when the land was used for agricultral purposes. In present day it is has been unchanged for over 50 years with a well-tended tropical garden and serene ponds surrounding eight traditional Thai houses, each of house full of fine arts, antiquities and oddities belonging to Prince and Princess Chumbhot. The Royal couple converted their traditional private residence to a museum in 1952, which is the first instance of a Thai Royal family doing this. The Royal couples rationale was that while treasured and coveted possessions are an individuals private property, they are still a part of the Thai peoples heritage and should be made accessible to all.The Chumbhot – Panthip Centre of Arts is host to prehistoric Ban Chieng artifacts dating back to the , Bronze,Neolithic and Iron Ages.These extremely rare and historically items of painted pottery,tools and bronze weapons, are indicative of a Southeast Asian civilization that equalled Egypt and Stonehenge in terms of technological and social advancements. After liberating Siam (Thailand) from the Burmese in 1767, a provincial governor called Taksin was crowned King. He constructed Wangderm palace to mark the creation of the new capital in Thonburi. Situated on the west bank of the Chao Phraya River near Wat Arun (The Temple of Dawn), it stands on a site which was previously of great strategic importance which was located behind the Wichayen Fort and various other fortifications that protected access to the Kingdom’s port. 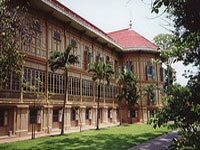 oday it serves as the headquarters of the Royal Thai Navy. Many original buildings and architecture remain, such as the Throne Hall. This traditional Thai structure was constructed when Thonburi was established, and consists of a large open pavilion used by the King to receive guests. 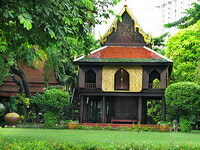 There are also two Chinese-style residences, constructed at the beginning of the Rattanakosin period with the smaller residence containing a collection of traditional Thai weapons displayed alongside depictions of King Taksin’s military achievements, the larger residence exhibits a collection of antiques and paintings. Other buildings of interest situated at the site include a King Taksin shrine, Whale Head Shrine and King Pinklao’s residence.